Rather than follow the boring interstate through Nevada, I planned this route over US395 and across US20 instead. At 961 miles (Google Maps) some overnight breaks were certain. I stopped in the old mining city of Susanville where I caught US395. First stop, Goose Lake. Why? Because it is a really big lake on the map and I was curious. 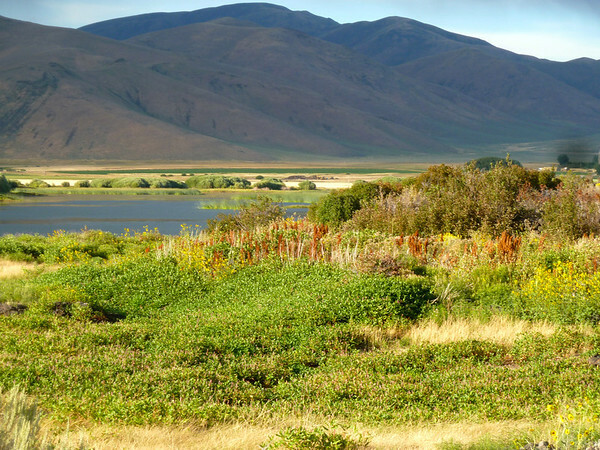 At 94,080 acres, Goose Lake is the third largest in California after the Salton Sea (240,640) and Lake Tahoe (122,000). It was formed by glacial movement and is too long to see across. The slightly overcast day made for some great reflection shots off the beautifully “barren” cliffs. A lakeside lunch stop was followed by tentatively dipping my toes into the frigid water. I continued to Burns, Oregon, a mid-size town, where I spent the night at a local motel. The owner recommended the Meat Hook for dinner. The Meat Hook is a nondescript local restaurant geared toward the serious carnivore. I had one of the best ribeye steaks ever there and the cost was only $16.00 with soup, salad, veggie and baked potato. You can barely buy a ribeye in the market around Boulder Creek at that price! 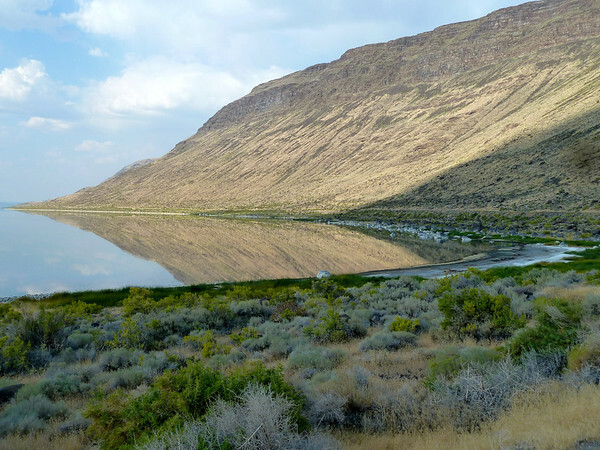 The following morning, I was on the road early for the long drive across US20 to Idaho Falls. 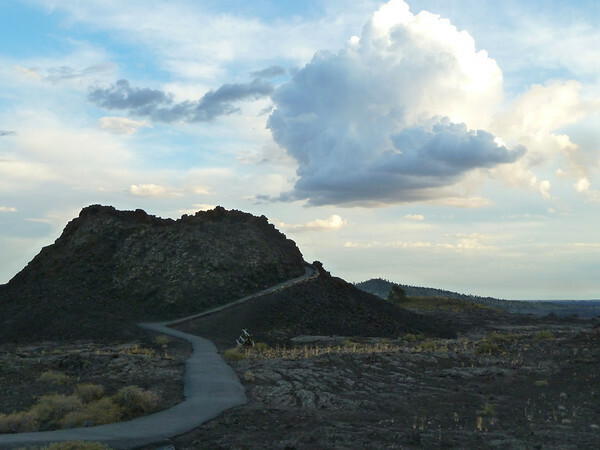 One reason I wanted to go this route was because I saw Craters of the Moon National Monument on the map. Having never heard of it I was intrigued. 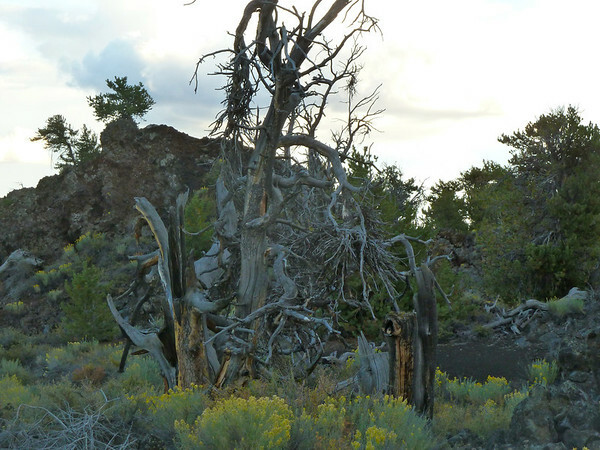 In mid-afternoon, as I drove over the Sawtooth Mountains, the landscape began to change. 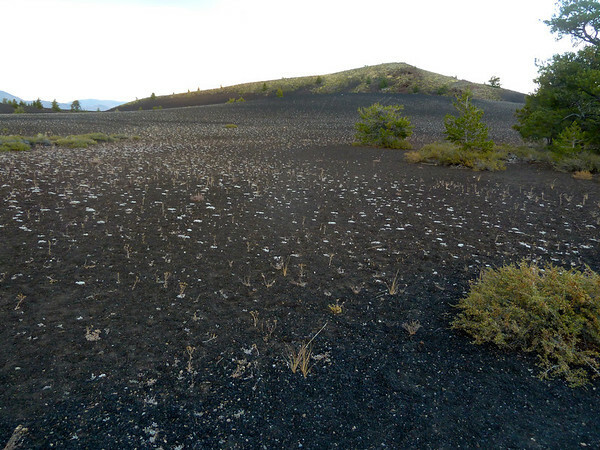 As I combined a walking and driving tour of the monumental lava fields, I came across a large hill and basin of black sand which appeared to be dotted with small white cotton balls. 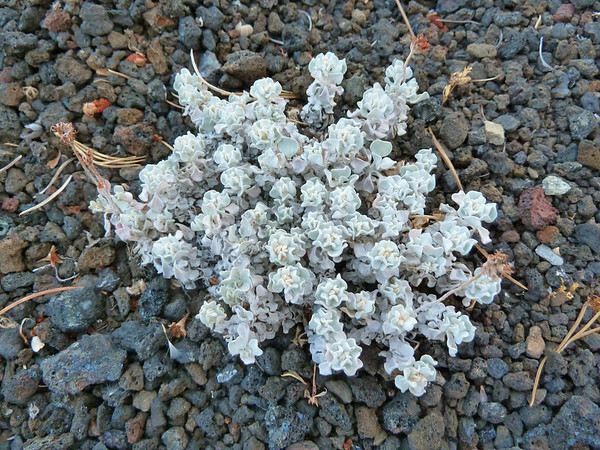 Hiking up for a closer inspection I found them to be very delicate succulents growing in this desolate area! Each "flower" is about the size of my fingernail! 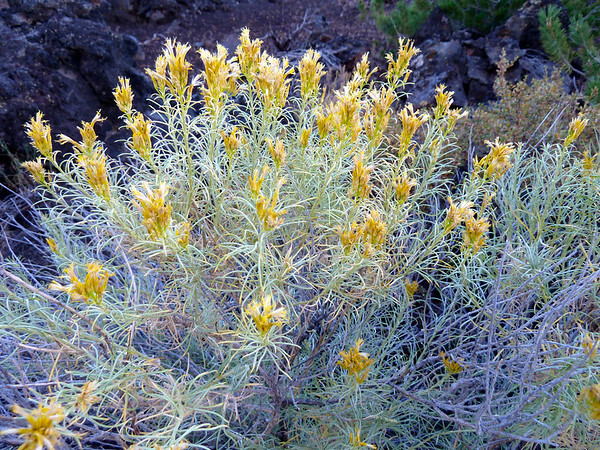 In fact, I continued to find unique plant life as I further hiked the monument. 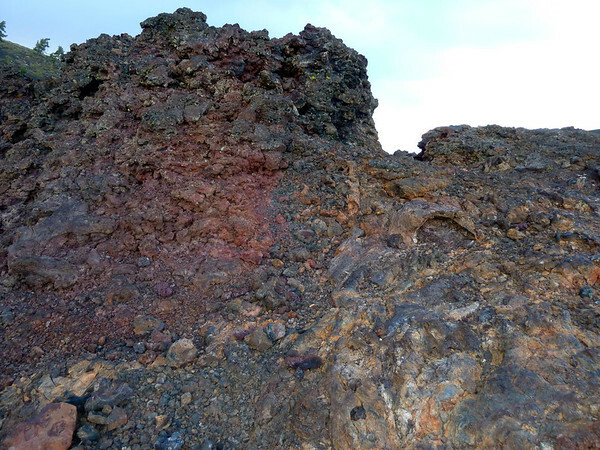 Dusk was approaching, but I wanted to climb a cinder cone before I moved along. I would have stayed the night, but my complimentary room at the Hilton Garden Suites in Idaho Falls awaited. The next morning, I left for the 50 mile drive into the Yellowstone. 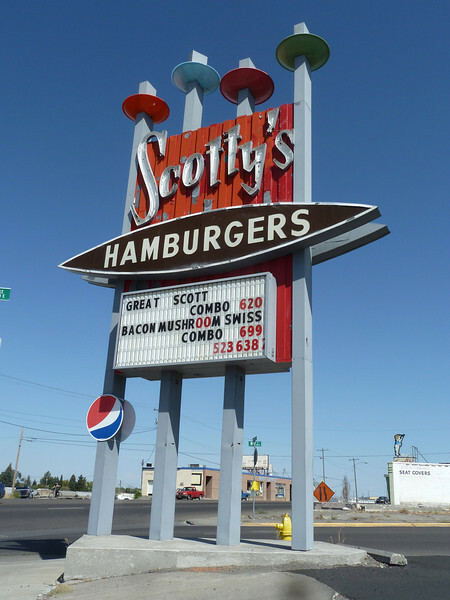 But leaving Idaho Falls, I was amazed to find this vintage art deco sign, flying saucers and all! Thanks Alisha. Great to hear from you. I am in awe of and inspired by your photos from Uganda. You truly are a special and extraordinarily compassionate being and I am honored to have you as a friend. I like your reasoning for visiting Goose Lake. Thanks Stephanie! When are you going to Patagonia?